Wayne Mark Rooney is an English footballer who currently plays as a striker for English Premier League club Manchester United and the England national team. Rooney began his career with Everton, joining their youth team at age ten and rising through the ranks. He made his professional debut in 2002 and his first goal made him the youngest goalscorer in Premier League history at the time. Before the start of the 2004–05 season he moved to Manchester United for £25.6 million and became a key member of the first team. Since then, he has won the Premier League three times, the 2007–08 UEFA Champions League and also the Football League Cup. 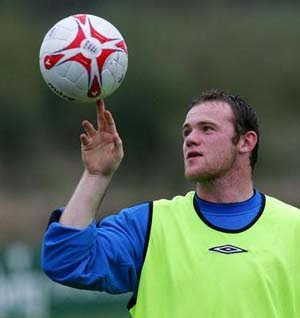 Rooney made his England debut in 2003 and at Euro 2004 he briefly became the competition's youngest goalscorer. He is frequently selected for the England squad and also featured in the 2006 World Cup. Rooney's wife Coleen gave birth to their son, Kai Wayne Rooney, on 2 November 2009. Love Wayne Rooney and congratulations on his latest baby!